diana lynn's painting a day: Heads-Up. Just in case you need reminding. You still have two days. : ) Such big hopes I had for this one. I was hoping to capture the reflection of red heart on the silver ones and to make each one look foil-like. I did not, however, notice the multitude of edges I would need to render in this collection of hearts until I had committed too much time to give up. Good lesson for me though. 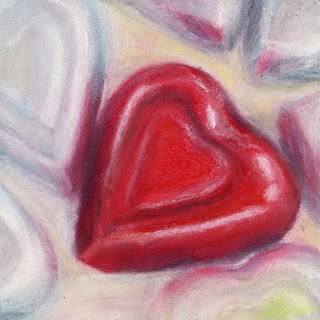 When it comes to hearts, it may be best that I see the just the heart and not all the edges.